Tuesday. Sunshine. This is more like the weather we were expecting – blue skies, a slight breeze and the mercury rising to a nice 21 degrees (not that they use mercury any more, but you know what I mean). The Plan was to do an easy 50-ish, saving our energy for a big ride on Wednesday for Mark’s last day. 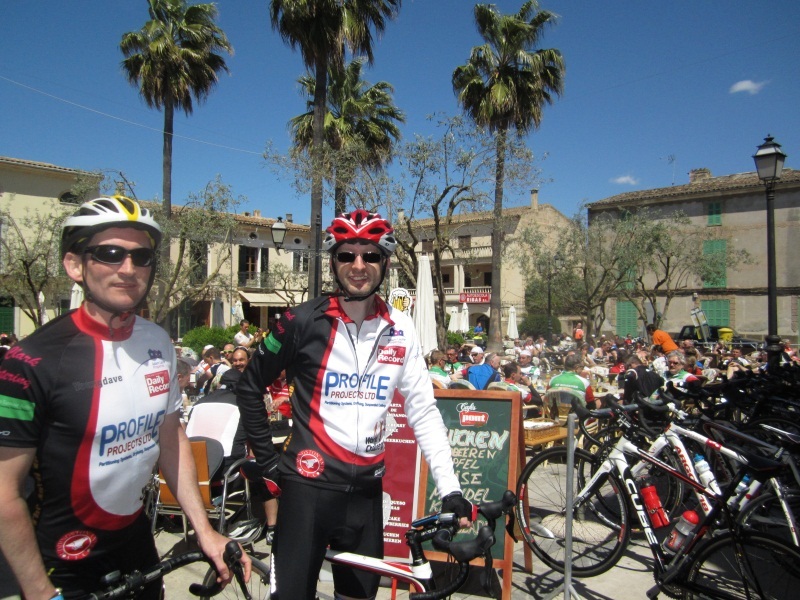 We headed out of Alcudia, target Petra, a village to the south. We turned off the main road and got a good session of taking turns at the head of the group, switching smoothly and rolling along at a decent pace, 18-20mph or thereabouts, not being too badly dented by the occasional rise in the road (not proper hills so I am told) or the wind. 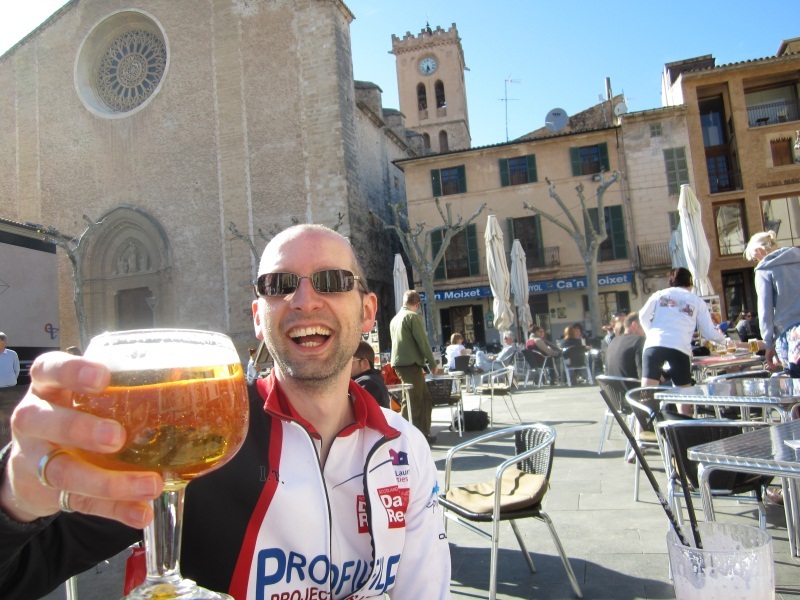 We arrived at a square in Petra filled with cyclists sat around eating and drinking, so felt obliged to partake as well. Chips, cakes, coffee and juice were taken on board, and several photos of the hundreds of bikes and cyclists snapped. 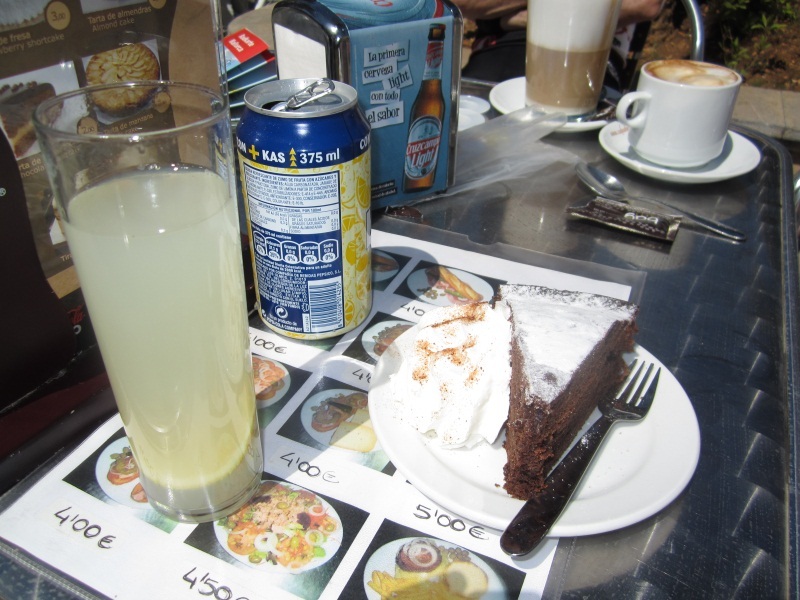 Obilgatory cake picture next to 'limon' drink with a mere 31g of sugar in it. We headed out of Petra, wanting to arrive at the next village on our route, Sineu. A slight mis-turn found us taking a climb up to a monastery at the top of a fairly decent climb, hairpins and blind corners (the usual for round these parts). We hit the top as a group, parked up and took in the view – you could pretty much see the whole north of the island, probably the whole place if you took the time to climb the tower itself. We weren’t up for that, so headed down, returned to Petra and took another road out, back on route to where we wanted to go. Sort of. We knew we wanted to take a right somewhere along the road we were now on, I was in the lead, Mark called a right, and we turned up an ok looking road. Not far along, we realised this road wasn’t going anywhere except to a quarry. 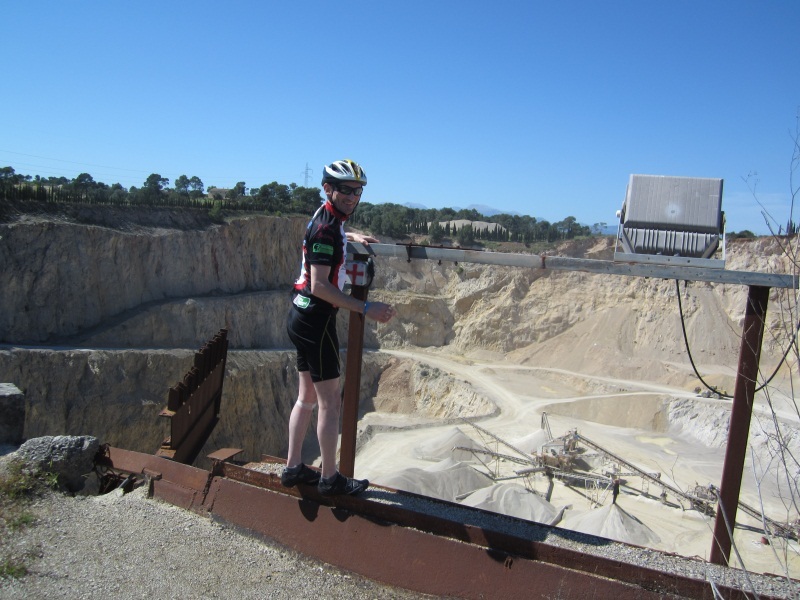 Every Majorca cycling holiday should take in a quarry, highlight of the week. We turned around, back to the ‘main road’ and followed it, eventually hitting Sineu (not much to see except the railway) and exited it toward Llubl. 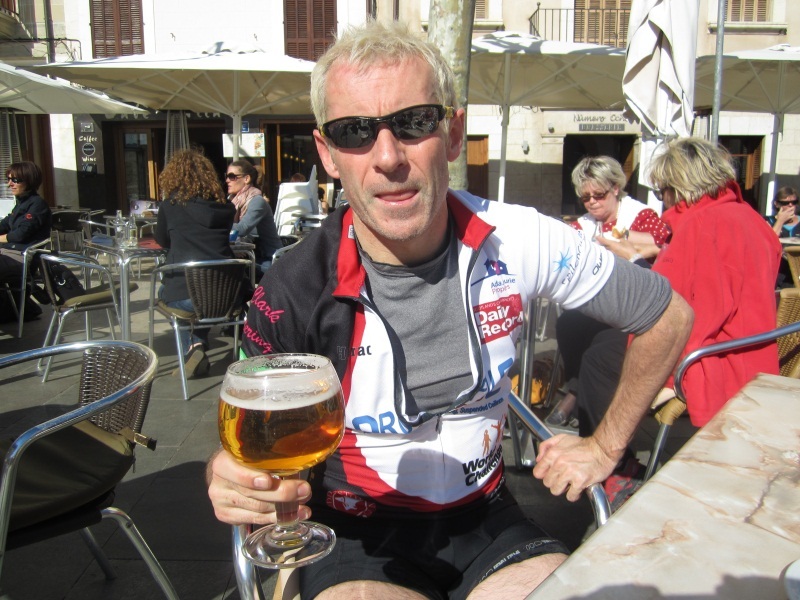 We arrived in Llubl, and stopped at a cafe for a quick drink, but no-one seemed to be about to serve us, so we pushed on. We tagged on the back of a group of 9 or so folk seeming to be going our way, so our pace increased a notch until we got to La Puebla where we took a different route. 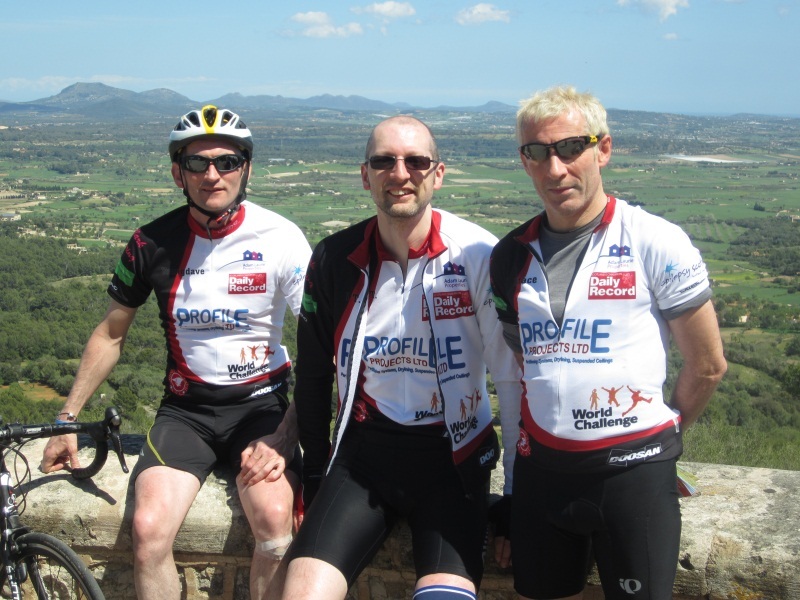 We found ourselves on a busier road to Pollenca, taking turn about at the front on a mix of ups and downs, the wind against us for most of it. 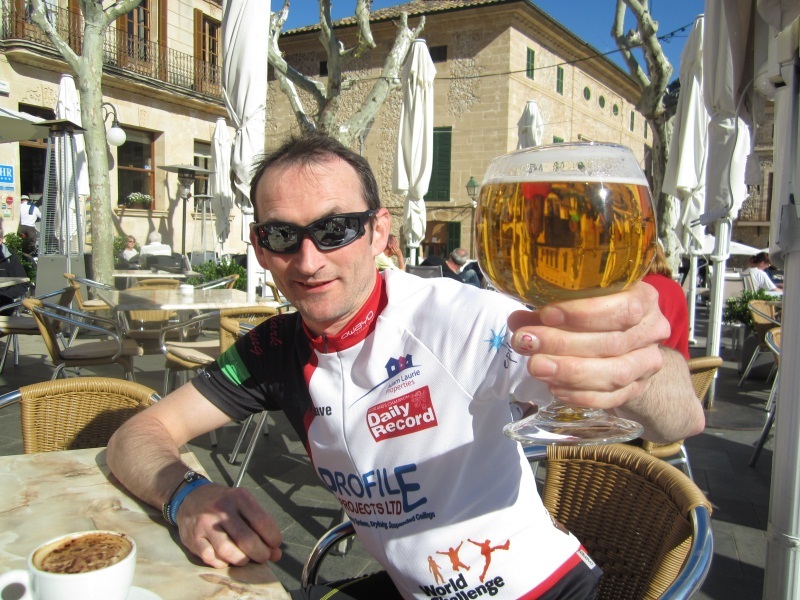 We stopped off for a welcome beer in Pollenca itself, enjoying the sunshine and a bit of chat with some cyclists at the next table. We then headed home, a similar route to our first days outing, and similarly got a bit lost missing a turn or two at the round-a-bouts but eventually getting it right and arriving home in one piece. Our 50 miles turned out to be 65.97 miles, but a decent pace of 16.2mph average. Here’s hoping the weather holds for the rest of the week. Recently we have been saying….